Adding a call-to-action (CTA) to a post is a known way to drive people from Facebook to your landing pages in or outside of Facebook. However, until recently the only way to include a CTA wasn’t very effective – you had to write actions like ‘Click Below’ into the post’s description, which is often overlooked. Fortunately for us page managers, this changed. In December 2014, Facebook released a new feature allowing businesses to select a CTA button – like Contact Us or Sign Up – to add to the top of their Page. Two months later, Facebook added buttons to adverts to help businesses drive traffic to their landing pages. Suddenly it was a lot easier to encourage your audience to click-through from your page or advert. However, at Social.iQ, we began wondering about the basic link. Links are a great way to direct your Facebook followers to content stored outside of Facebook, especially if you don’t have the budget for an Facebook advert. Only thing is, they aren’t very clickable. So we got talking to our technical team, and voila! 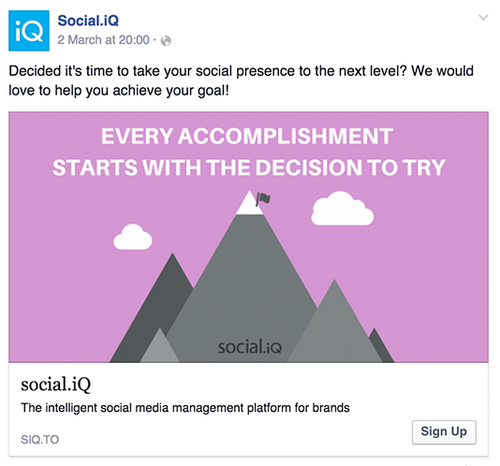 Now on Social.iQ Pro, when you go to publish a link, you’ll see the option to add a CTA button – like Learn More or Download. Then when the link is published on Facebook, the button will appear in the bottom right-hand corner, just like a paid advert. It may seem simple, but a CTA button is deceptively powerful. Want to test out their effectiveness for yourself? Login to Social.iQ now. Don’t have a Social.iQ account? Let’s get you started and go Pro.